Luxembourg. Wenceslas II, AD 1383 to 1388. Silver Gros an Gene. Denomination : Silver Gros An Gene. Reference : Weiller 154. Probst 184. Size : 27.5 x 28.0 mm. Weight : 2.75 grams. Grade : VF but weak areas on the obverse, and a small lamination has come away on the shield below the crown. 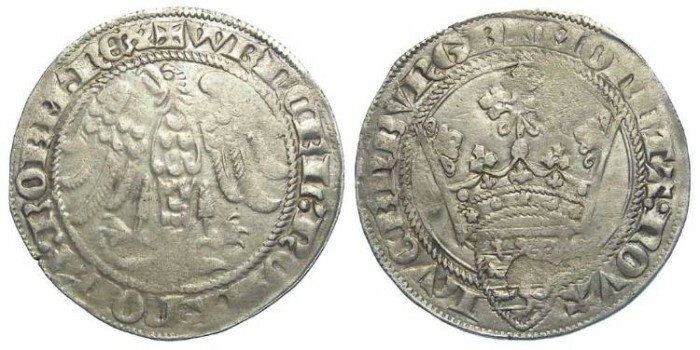 Obverse : Eagle with wings spread, with WENCEL ROMANOR Z BOEM REX around. Reverse : Crowned shield, with MONETA NOVA LVCEBVRGE around.